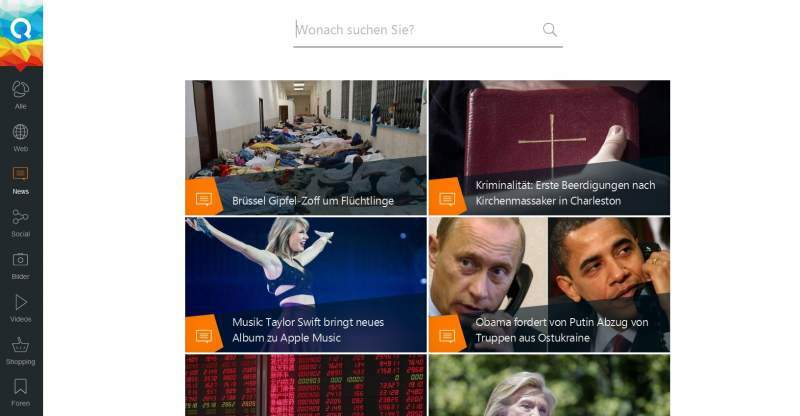 With qwant another Google Alternative enters the search market. The Research Assistant promises more privacy while surfing, but also scores points with further reasonable aspects. Unlike its competitors qwant stores no permanent cookies on the computer, but only defines for each session one of these text files in which the search behavior is stored. After the session is completed this virtual cookie is deleted. This provides quasi en passant that the pre-filtering of search results, as performed on Google, Yahoo and Co., is omitted here. As initially somewhat unfamiliar to the surface leads on qwant. addiction results appear in place of the usual form of a list in the form of a tile-like representation, including preview images. The home page presents here currently frequently searched topics. Requests the user down the search engine on columns, where the findings are broken down by web, news, Knowledge Graph, social and shopping. Furthermore borders tabs, the hit to the effect one what they have to tell the media and individuals to the relevant topic. Smart: Who sets up an account at qwant, regarded as useful discoveries can store in the form of a notebook and present this option in the network. In addition, this account can be linked with accounts on Facebook, Twitter, etc., which facilitates the sharing of certain web finds via social network. Conclusion: Definitely an interesting alternative to Google, Yahoo and Co., lodged reportedly cooperating with Firefox OS and thus is pre-installed on respective smartphones and tablets. In a similar way, notch cut DuckDuckGo, Start Page, and Ixquick.